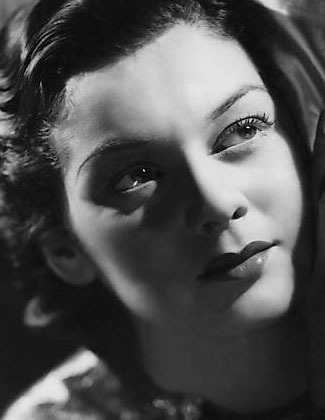 Why do you suppose I have a website dedicated to Rosalind Russell? How did she captivate me so completely that I felt it necessary to in turn moderate a Facebook page also dedicated to this actress? When people list their favorite actresses, women such as Bette Davis, Vivien Leigh, or Katharine Hepburn inevitably pop up, but where does Rosalind Russell fall on their list? On average, she does not appear on their list at all. So I think one of the more underrated actresses is the best. It happens. The main reason Roz became my favorite is because of her ability to infuse drama, comedy, and bubbling personality into one role. But is that the only reason? I can tell you it is not. There are many reasons, in fact, why I idolize her so much. Whether she is in a dramatic or comedic role, she has a way of always making her audience laugh or cry and they are seldom bored by her. Rosalind had a gregarious and fun personality her entire life, probably from the moment she was born. This particular personality tends to show in her performances onscreen. Even in her early roles in which she was often a snobbish English lady, somehow I can feel she was just busting to get out of such a role. She needed something fun, and the only way for her to finally burst on the scene as a star, she needed to show off her comedic skills. The Women is what truly made her a sought-after star, and what followed is one of her most iconic roles (Hildy Johnson in His Girl Friday). The type of comedy that Rosalind is famous for—rapid-fire dialogue without missing a beat—is my kind of comedy. However, my adoration for Rosalind Russell goes beyond what she was capable onscreen, and yes, she can make me cry if I just look at her sad face in certain dramatic pieces. It was when I read her autobiography, Life is a Banquet, that Roz became one of the best people in the world to me. Her sense of humor did not only exist in her comedy roles. No! She had a witty way about her in just walking down the street, talking to friends, talking to strangers even! And another thing that struck me was her fearless strength in the face of anguish and pain. She was first diagnosed with a cancerous tumor in 1959 and with rheumatoid arthritis around 1971. Of course, she would never let anyone know about her cancer, as it was a taboo subject at the time. In fact, only her family and her costumer, James Galanos, knew. She would never want anyone to know she was suffering and she made sure to not let it show. Even through mastectomies and I am sure a tremendous amount of pain, she continued to work when she could, and she was just as feisty as ever. She always had a sense of humor about everything that came her way and this did not stop when she was suffering from disease. She will always be such an inspiration to me and my idol forever. Roz, my hat is always off to you and I will help preserve and spread the word of your memory and work for as long as I live. Oh my goodness…..that was such a wonderful and moving piece Desiree! I see why you love Roz so much. And she has quickly moved up my favorite actress list as you well know. Thank you for sharing your inner most feelings about this wonderful woman! Really a fine tribute to someone who really knew how to live, live, live!! What a beautiful and moving piece, Desiree. Thank you so much for sharing your feelings with us. I told you the other day that I was really beginning to like an admire, Roz, and this makes the feeling even stronger. She was truly a courageous lady, and, yes, I’m sure she would like knowing how her popularity has lived way beyond her human mortality. It’s sort of interesting that you decided to write this in November. This month will mark the 32nd anniversary of Natalie Wood’s death, and I am planning just this sort of memorial. Love you! Oh, and, you made me cry again! I have kept a poem in my desk written by Rosalind Russell for over 20 years.It begins: there is nothing whatever the matter with me. That poem has always been an inspiration to me and because of it, I never complain about anything! She was my favorite actor,read her biography written by her husband, etc. There was no one like her and I doubt there ever will be. Ok. I’m a straight, happily married midwestern 50 year old guy. And I love Rosalind Russell! Pardon my language but what a dame! I’ve watched every movie she ever did – most a dozen times. Can’t get enough. Reminds me of a composite of every great woman I’ve ever met! !